As all country have legal requirements for starting a business, Bangladesh also the same requirements. And this is because you’re here to get the proper information about how to open a business in Bangladesh and what the requirements are for that, right? Consequently, we’re also here to introduce you the system and what you need to start a business in Bangladesh as the official requirements. In this concern, simply continue reading the content and you’ll find it’s nothing a tough thing. It may obtain profound personal and professional rewards while starting a small Business of your own. However, your days of punching the clock on a regular schedule will end if you take the leap. Also, will energize your career and make the long hours that await you melt away while starting your own small business. 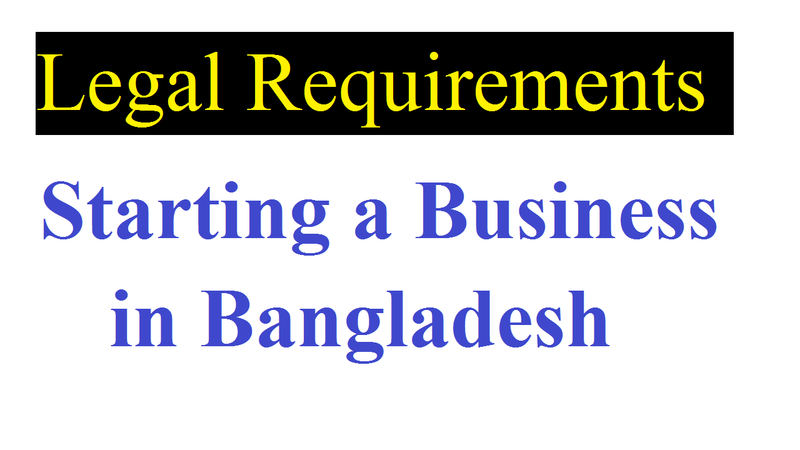 What are the Legal Requirements for Starting a Business in Bangladesh? It’s important to know the ways and the legal requirements of a business set up in Bangladesh as foreigner or nonresident. According to the law of Bangladesh, there are 100% foreign Ownership Company, a subsidiary company, branch office open is allowed. Bangladesh has a different policy from each other for setting up a business. For example, you need RJSC permission, BOI approval, income tax and VAT license, bank account opening, etc. There are similarities and dissimilarities of the laws of other countries while opening a business venture in Bangladesh. However, the foreign investors like to invest in many sectors considering good return within a short time due to many causes. They prefer to invest in Bangladesh for the low labor cost, easy availability of the raw materials, easy to manage government, similar industry, tax rebate and some more issue. How to Start a Business in Bangladesh Fulfilling the Legal Requirements? Although we’re going to provide the necessary information for the foreign investors, the local investors can start a business in Bangladesh easily. Those who are planning to start a business here as a foreign investor, we’ll focus on them in general. Before planning to start a business, you have to know Bangladesh at first. Moreover, you have to know well the essential business licenses, human behavior, investment sectors, political environment, income tax rate, VAT etc. Now, let’s know what the legal requirements for starting a business in Bangladesh. For Shareholders or Directors: It requires minimum two shareholders to meet with the law to open a company in Bangladesh and no local shareholders/ directors are required. These shareholders will act as director of the company. Capital: Bangladesh’s not a limitation of investment capital to start a business for the foreigners unless need to apply for a work permit or E visa. Also, there are some more steps to register your company in Bangladesh. Like another country to register private limited company by the registrar of joint stock companies and firms, RJSC, it’s not easier. With this organ of government, all limited companies get the registration. Without a legal identity, business registration, no foreign investors allowed to start a business. What you need for your potential business is the plan of investment capital declaration, the figure of authoritative capital, number of shareholders, and the name of the future company and objectives. And a foreigner can hold 100 percent of shares and local shareholders or directors not require registering a new business, which is the most important information. Moreover, if the directors are a foreigner, a few consultant or lawyer or consultancy firms are aware of the procedure to register a new business. Besides, when the directors are foreigner business registration is different than local business. The authorities to register the branch office of the branch office are BOI and BEPZA in Bangladesh. As it’s the direct business involving is not acceptable by the branch office because branch office is income tax-free. Although it can expense from the remitted capital of parent company, it can’t receive any payment from the customer into a bank account. If you want permit of starting project office in Bangladesh, you have to contact BOI. It’s not free of income tax. But, for certain conditions, there are free tax options and you can hire manpower under your project office. Moreover, there is one different option, Franchise agreement. It can be sold upon conditions while being international business policy good. As global trade policy, the apparent company can open a franchise in any country. Location: As the location of the business is an import issue, you can choose Dhaka, which is the biggest one in Bangladesh with the highest traffic. Hiring Foreign Staff: If you want to hire foreign staff, you have to contact BIO. So, if you want to approve of the capability of hiring, you have to bring US$ 50,000 in the bank. There are some other things to consider, such as tax-free EPZ, manpower cost, raw material etc. For the legal requirements for starting a business in Bangladesh, you got almost all the necessary information. As foreign investors are a little bit difficult in Bangladesh, you may feel hardness to start a business in Bangladesh. Also, there are some other legal formalities to start Manufacture Company. But, you’re permitted to start a business in Bangladesh after completion of the legal procedure and licensing.